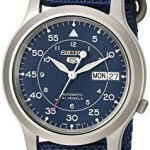 Seiko Men’s Watch SNK603k Review. Hello, today I’m doing a Seiko SNK603k review. 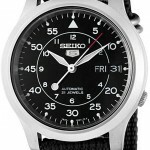 We’ve come to expect value for money from the Seiko 5 range, so I like to feature them on the site often. The model I’m looking at today has a brilliantly textured blue dial and an exhibition caseback, so this should be an interesting one. Anyway, I’ll get on with my SNK603k review below and you can find out the price on Amazon today, enjoy. 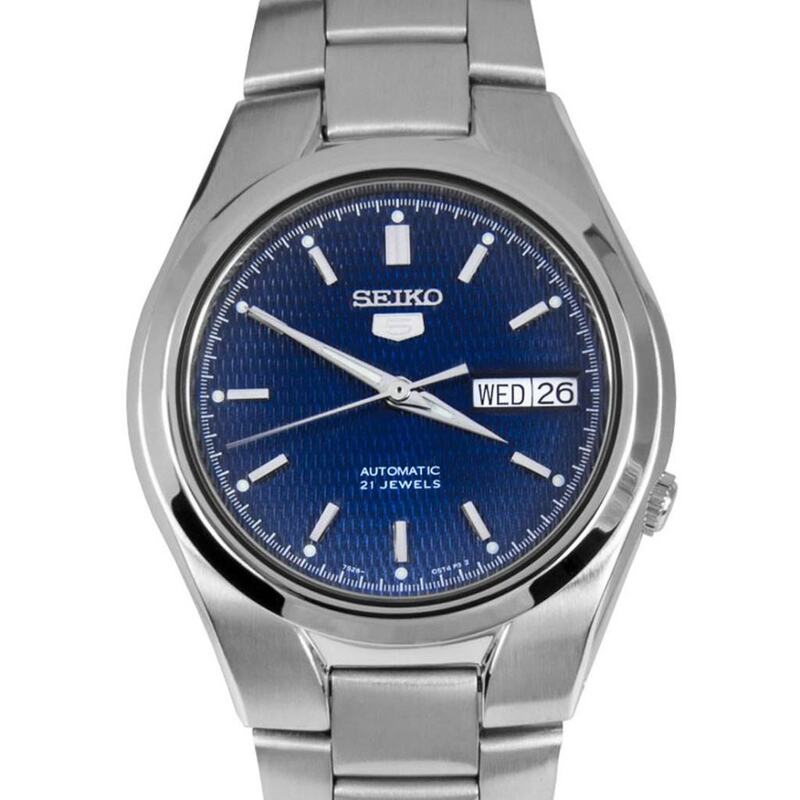 For over 50 years now Seiko has been setting the standard for affordable, quality automatic watches with their Seiko 5 series. The model features the typical crown hidden behind the 4 o’clock position on the case. The whole idea of the 5 series is to keep the watches accessibly priced and I feel they’ve always done well at this. The watch has some nice textured detailing on the dial and the deep blue really makes the dial stand out. There’s some use of lume on the watch hands and the dots on each hour, this makes the watch easy to read in dim lit conditions. The watch is actually smaller than a lot of these larger timepieces we see these days as well with a 37mm casing diameter so I’m sure those who like smaller watches will prefer this. The watch has a really nice Japanese automatic movement caliber 7S26. This is a reliable 21 jewel movement that can actually be viewed through the exhibition case back which is a really nice feature. As is typical of most automatic movements, once you stop wearing it for a day or so it will run out of power. You’ll simply need to give it a starting wind to get going and adjust the time when you next use it. As is quite typical in this price range, this watch uses a mineral style glass for the front and back of the watch. Mineral glass is often used due to its good level of scratch & knock resistance, and it’s affordability which is important for keeping the watch at an accessible price. I mentioned earlier on that this is a little smaller than the typical 40mm+ watches we see so often these days. The casing diameter of this watch is 37mm and it has a thickness of 11mm. There’s a very easy to read day and date display at the 3 o’clock position. Due to the white background on this feature, it does stand out quite well which makes it easy to read. You will need to adjust it for the varying amount of days in each month, though. I’ve got a picture below of the strap which also shows off that exhibition caseback I mentioned earlier on. 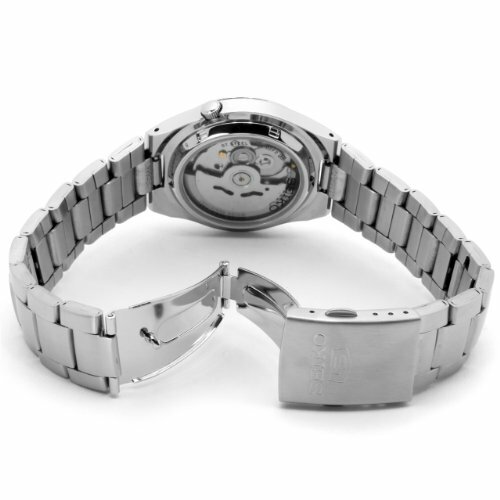 The strap is made of stainless steel and has a standard linking structure. The strap itself is 20mm wide which is a fairly common strap width. As for the clasp, they’ve gone for a fold over style with double push button release. I happen to prefer the push button release straps as I find them much easier to operate. The water resistance rating isn’t so high at just 30m, or 3ATM. 30m water resistance does still make it suitable for everyday use. Splash/rain resistant. It’s Not suitable for showering, bathing, swimming, snorkeling, water related work and fishing. 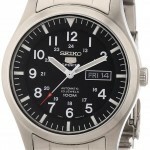 As I expected to see, the Seiko 5 is a brilliant watch for the price. It looks like a much more expensive watch than it is which is great. Seiko are known for their high quality builds and that’s clear with this model also. Overall it’s a very well priced watch that people seem to love. Hope you found this Seiko SNK603k review useful and enjoyable, comment below and let me know what you think of it.